My review for today is on a BBC, sci-fi, widely popular, and my new favourite TV show. My dad, a big fan, had been telling me for a while that I really needed to watch it. I finally got around to doing so this fall/winter 2013 semester. With further ado, I present to you...Doctor Who. My first opinion? I loved it right away, and I love it even more with every episode I watch. I'm a sci-fi/fantasy type of person, so it fit right in my groove. It is funny, enjoyable, fast-paced, and explores some of those deeper questions like that of life and death, human's potential, and (one that I do have some problems with, but I still like that the topic was explored) God and Satan. There is romance and friendships. The characters are relatable and are well-developed. The villains are brilliant. I do have a couple of minor issues about the show so far that I thought I should probably warn you about. There is one character who is represented as bisexual, and he appears in a few episodes in the first and third seasons (called 'series' in this case, for some reason). There are two short scenes with him that I found to be a little inappropriate. Also, in the episode "The Satan Pit", the Doctor is portrayed to be somewhat of an atheist - and he also believes Satan/the Devil to be only an idea. One of the main character's mother, whose husband died several years ago, seems to be mainly interested in finding a new partner. However, she does come to the realization later on that there is no one really for her other than her gone husband. There are also a few passionate kisses and some minor language. Besides this, I wouldn't recommend this show for anyone much younger than myself (seventeen) because of the abundance of scary scenes. Honestly, I think that the best description of DW would be, in addition to a tear-jerker, a spine-chiller. 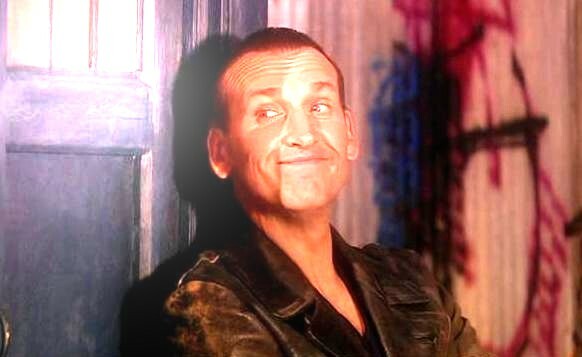 The Doctor: The Doctor, whom the show is about, is played by Christopher Eccleston in the first series and David Tennant in the second and third series. He is the last of his kind, the Time Lords, and he travels through space and time, helping save people wherever he goes. His travelling machine is a blue box called the Tardis. He often travels with a companion (usually female) to help him - and to help alleviate his loneliness. One of the Doctor's big problems is that he lives much longer than any human being, and so he ends up losing someone he loves. Rose Tyler: Rose (played by Billie Piper) is the Doctor's companion in the first and second series. A nineteen-year-old shop worker, she meets the Doctor quite by accident in the basement of the shop where she works. Rose is portrayed as brave and down-to-earth. She and the Doctor fall in love, but she is trapped in a parallel universe after some of the Doctor's biggest enemies, the Daleks, come to rule the Earth. Rose's character has received much praise from both fans and critics. Martha Jones: Martha (played by Freema Agyeman) is the Doctor's companion in the third series. An aspiring Doctor, Martha meets the Doctor in a hospital that is transported to the Moon by an alien police. She has been described as being the companion "whom the Doctor required the most of", which I think is quite true, as far as I have seen. Martha leaves the Doctor at the end of the third series when she realizes that the Doctor will never love her. 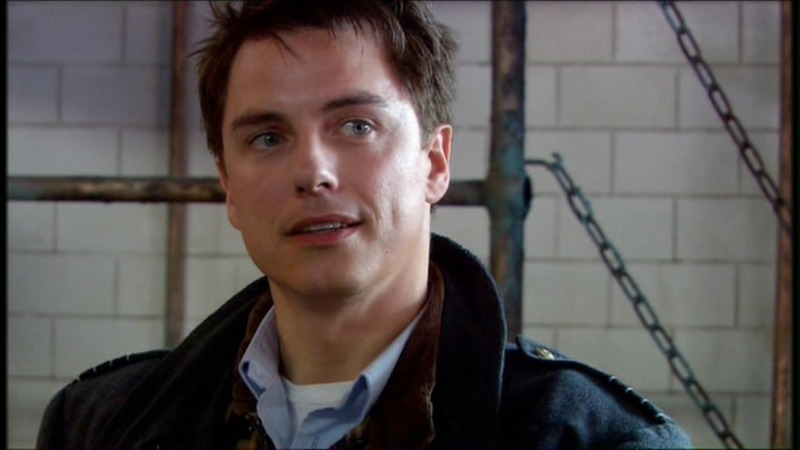 Captain Jack Harkness: While Jack (played by John Barrowman) appears in only a couple of episodes in the three episodes I have seen so far, he is definitely one of the Doctor's companions. Besides the fact that he flirts with both sexes, I have to admit that Jack is very funny, brave, and pretty awesome overall. He is an action-based character and certainly not a conventional hero. 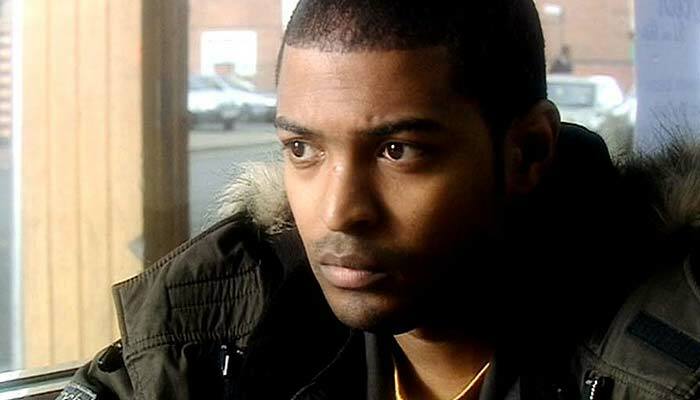 Mickey Smith: Mickey (played by Noel Clarke) was Rose's boyfriend until the Doctor came. 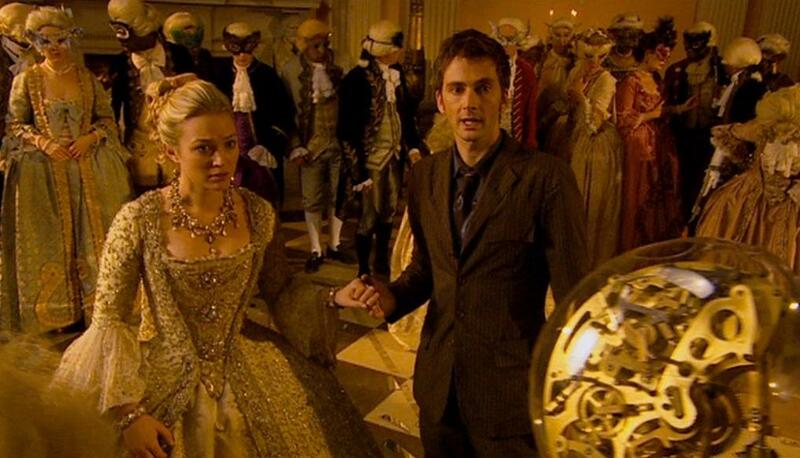 Unlike Rose, he is terrified at first by all these appearances of aliens and the Doctor and his blue box (as I'm sure I myself would be in his position). Mickey learns to accept Rose's love for the Doctor and grows into a much more confident, brave, and faithful young man. 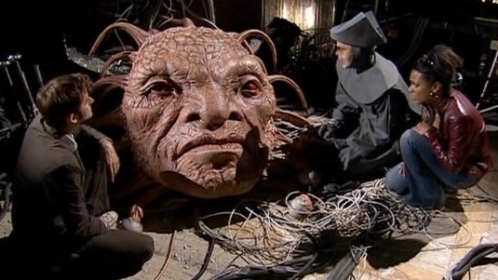 He appears in series one and two. The Daleks - This bunch is a biggie. These things that look like a robot with a plunger attached to them are actually a lot more dangerous than they look. The Daleks were created to kill and have only one emotion - that of hate. In fact, the Daleks were what killed all of the Doctor's family and Time Lord friends. And they also seem to never be able to be destroyed, appearing at least once in every series. Cassandra: The Lady Cassandra, who has gone through so many operations in her attempts to remain a "pure human" that she is mainly skin and lips, is voiced by Zoë Wanamaker. In Series One, she attempts to destroy a space station to be able to pay for her operations. 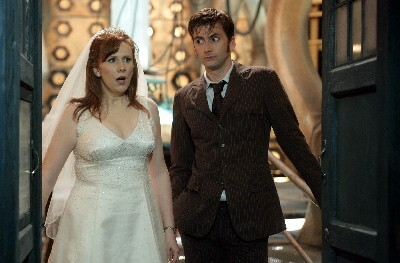 In Series Two, she reappears and takes over Rose's body in an attempt to escape to her imminent death. The Family Slitheen: This family of green aliens wants to destroy the earth and sell the rubble to make their escape away from it. Rose and the Doctor, along with the help of MP Harriet Jones and Mickey, defeat the Slitheens. Unfortunately, one of the Slitheens survives and makes a second comeback in Series One. The Cybermen: These robots were created by a mad man for the purpose of living forever. The Cybermen have all emotions removed and are obsessed about "upgrading" any and all humans into their form. They appear in Series Two several times. The Master: Like the Daleks, the Master and the Doctor go way back. In fact, the Master is a Time Lord. He seems to be defeated, yet he keeps appearing over and over again throughout both the new and original DW series. He appears in a glorious three-parter in Series Three (played by Derek Jacobi and John Simm), and is depicted as a villain who has a sense of humour, who loves to be in the center of attention. If I was asked to compare him to another villain, I'd say James Moriarty from BBC's Sherlock without even stopping to think about it. Doctor Who Original Soundtrack: 3/The Doctor's Theme, 6/Father's Day, 13/Harriet Jones, Prime Minister, 16/The Face of Boe, 27/The Impossible Planet, and, the best of all of them, 26/Doomsday. Doctor Who Series 3 Soundtrack: 4/The Carrionites Swarm, 8/Mr. Smith & Joan, 9/Only Martha Knows, 11/Just Scarecrows to War, 12/Miss Joan Redfern, 13/The Dream of a Normal Death, 14/The Doctor Forever (there's so many in a row b/c they come from my favourite DW two-parter so far), 18/The Futurekind, and, most of all, 22/This is Gallifrey. And "YANA" & "The Master Vainglorious" & "The Stowaway"...and I better stop now before I mention every single track. (Just because it is absolutely necessary that I talk about this). I loved most of the episodes from this one, so I'll just go with the two-parter #12 "Army of Ghosts" and the famous #13 "Doomsday". While I said above that the three-parter with the Master was very good, one of my absolute favourites of all episodes so far is the two-parter #8 "Human Nature" & #9 "The Family of Blood". The episode where the Doctor meets Martha, #1 "Smith & Jones" was also very good. I haven't watched any of the specials yet, so I don't know if any would make this list or not. Let it be known, however, that I don't think there is a single episode I don't like so far. Audience: IMBD says PG, and I agree. However, I really think it depends on the person. I didn't find a problem with The Lord of the Rings at 13, and I was scared by Doctor Who at 17 but not to a huge extent. My sister, who's ten, has seen some episodes, and there hasn't seemed to be any problem. If anything, I wouldn't call it a family show. Rose: I can see everything... all that is... all that was... all that ever could be. The Doctor: But that's what I see. All the time. And doesn't it drive you mad? Rose: ... It's killing me. You're a fine businessman, John, but you're not God. He's like fire and ice and rage. He's like the night and the storm in the heart of the sun. He's ancient and forever. He burns at the centre of time and can see the turn of the universe. And... he's wonderful. I'm John Smith, that's all I want to be, John Smith. With his life... and his job... and his love. Why can't I be John Smith? Isn't he a good man? Why can't I stay? 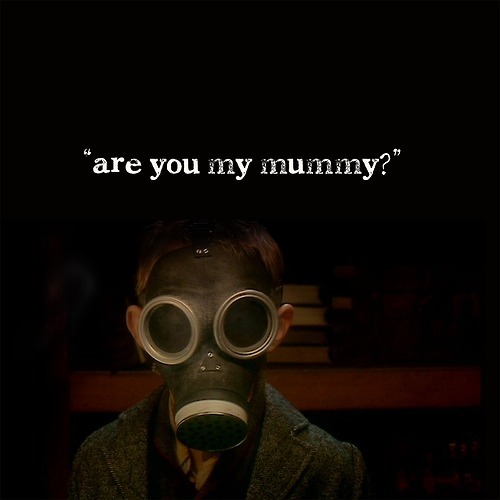 "The Empty Child" and "The Doctor Dances" are my my favorites from season 1 as well. I have been watching the series since it started, so those episodes really stayed with him when I was a kid (I was probably around 12 when it came out). Love those three episodes. "Blink" is one of my dad's all-time favourite episodes...but he doesn't like the other episodes with Weeping Angels. Strange...I love them all! First Ever "Ringing In the New Year"!